Teeth are fundamental to the quality of life throughout the human existence . An association between tooth loss and osteoporosis has been reported in the literature. Women with osteoporosis are three times more likely to experience tooth loss than those who do not have the disease [2,3]. Osteoporosis as described by World Health Organization (WHO) is a progressive systemic skeletal disease characterised by low bone mass and micro architectural deterioration of the bone tissue, with a consequent increase in bone fragility and susceptibility to fracture. The main treatment of osteoporosis involves the use of Bisphosphonates (BPs) to improve bone density and new bone growth. BPs act on macrophages in the blood reducing their life span and causing morphological alterations and changes in differentiation of monocytes into macrophages. This reduces the body’s ability to defend against pathogens . The action mechanism of BP is based on the inhibition of the farnesyl diphosphate synthase enzyme (FPPS), which in turn stimulates isoprenylation of small guanosine-5′-triphosphatases (GTPases), which signals proteins that activate and regulate changes in osteoclast morphology . There have been studies with a low level of specificity and many of them with a small number of clinical cases or a poorly defined control group that cannot suggest a direct link between BPs and implant failure. Therefore, the BPs effect on implant ostointegration is not well established . Subclinical hypothyroidism (SCH) is defined by the presence of serum free thyroxine levels (FT4) and triiodothyronine (FT3), within reference limits, in the presence of thyroid stimulating hormone (TSH) levels . There is evidence to suggest that subclinical hypothyroidism is also linked to dyslipidemia and osteoporosis . It is diagnosed based on symptoms and clinical signs associated with low thyroid stimulating hormone (TSH) levels . There are studies that confirm the association of low levels of TSH with bone demineralization and alteration of trabecular bone structure. [10,11]. Patients with SCH can present with anxiety, irritability, poor concentration, slow information processing, and poor learning in comparison to healthy subjects . Psychiatric illnesses such as anxiety, bipolar disorder or depression, as well as the medication associated with these diseases can reduce salivary secretion to the appearance of xerostomia . After the preparation of vital abutments, by opening the dentinal tubules the apparition of different degrees of dentin sensibility (DS) can be induced. Preparation of the teeth for full crowns can induce drying of the dentin, pulpal inflammation or even burn lesions after the reduction of the odontoblastic layer. Clinical researches demonstrated that the preparation of vital teeth for full coverage fixed prosthetic restorations can determine sharp, transient pain as a result of DS . The hydrodynamic theory of dentin hypersensitivity (DHS) suggests that external stimuli determine movements in the fluid of dentin tubules, which induce nociceptive transduction in adjacent pulpal nerve fibers [2-4]. Dentinal tubules contain the odontoblastic processes, which may extend from the pulp to the dentino-enamel junction. The odontoblastic processes are the extensions of odontoblasts and they are surrounded by dentinal fluid inside the dentin tubules. The dentinal fluid is an ultrafiltrate of blood from the dental pulp and represents the communication between the dental pulp through the odontoblastic layer and the outer regions of the dentin [5,6]. DS is characterized by a short and sharp pain, with a rapid onset. DS occurs after the removal of the protective smear layer, which determines the opening of dentinal tubules and the exposure of the odontoblastic processes to chemical, thermal, tactile or osmotic stimuli [6,7,8]. Great variations were observed in the prevalence of DS, which varies from 4% to 57% [9,11]. Sealing the dentinal tubules represents a current method in decreasing DS . 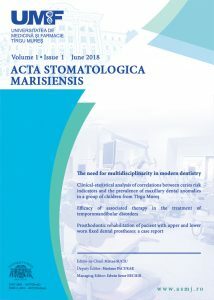 The therapeutic approach of closing the dentinal tubules, in order to impede the fluid shifts from the dentinal tubules, is represented by the application of chemical and mechanical methods in dentin desensitization. Significant advancement in the understanding and in treatment of DH, have been developed, respectively in the use of various methods and desensitizing agents [8,12]. The aim of this study was to measure the rate of microleakage between tooth and restoration according to the type of finish line and luting agent. Current scientific research has focused on the incorporation of lasers as part of the therapy of periodontal disease. It was proved that the wavelength of different types of units might have a positive effect on both soft and hard tissues healing process consecutive periodontal treatment. Periodontal disease is a multifactorial condition characterized by a microbial etiology and also a host inflammatory component. The contribution of lasers to periodontal health is determined by their antimicrobial, debridement capacity and biostimulation effect [1-3]. The lasers were introduced in periodontology more than 50 years ago, based on the evidence that wounds heal more quickly after irradiation with low-intensity lasers, a process that might be influenced by the stimulation of growth factors. High-intensity lasers were used as part of the nonsurgical periodontal procedures, in comparison with the conventional therapy for cement and soft tissue debridement, especially in order to reduce dentinal hypersensitivity . Laser light has three main characteristics: is monochromatic, directional and coherent. It can be delivered to a tissue area as continuous wave, running pulse mode or gated-pulse mode. The action of lasers on hard and soft dental tissues as well as microorganisms is influenced by the absorption of the laser by tissue chromophore as apatite minerals, water or pigmented substances found at the targeted site [5-7]. Soft tissue lasers proved to give good results in bacterial reduction and coagulation, with erbium group showing a bactericidal effect on Porphyromonas gingivalis and Aggregatibacter actinomycetem comitans. The aim of our study was to evaluate the effectiveness of an Er:YAG laser used during scaling and root planning. It will be compared with the conventional periodontal debridement methods, represented by sonic, ultrasonic and manual instruments and based on images obtained with the scanning electron microscopy, we intend to measure the in vitro effects of Er:YAG laser on the root cement. Common superficial oral lesions include recurrent aphthous stomatitis, candidiasis, recurrent labial herpes, erythema migrants, hairy tongue, and lichen planus [1,2]. The recognition and the classification of oral lesions have a considerable significance in the process of diagnosis. The correct diagnosis is accomplished through the knowledge of the various lesions, a thorough history and a comprehensive clinical oral examination for the precise diagnosis in the process of differentiating between the specific conditions, management, as well as counselling [3-5]. Ulceration due to aphthous stomatitis (AS) represents the most common oral mucosal inflammatory disease, most frequently starts during the second decade of life, affects about 20% of the population and has a female predilection [6,7]. The etiology of AS is varied and is due to the perturbation of the oral ecosystem. The oral environment is unique, and is able to induce reactivity of products from the prosthetic restoration materials. The biological reactivity of dental materials in the oral cavity can induce reactions of the oral tissues against the bacteria’s adhesion, reactions to the mechanical irritation, to the direct toxic effect, and to the allergens . Habitually, AS lesions begin with prodromal burning sensation, 2-48 hours before the appearance of an ulceration. AS debut is painful. It has the appearance of a rounded ulceration masked by fibrin, with erythematous margins, located especially on the nonkeratinized oral mucosa [9,10]. Although oral health has improved worldwide, oral diseases still continue to pose a major public health problem, especially within communities belonging to socially disadvantaged groups who still face increased levels of carious lesions and periodontal diseases. Currently, the distribution and severity of oral diseases vary greatly from one country to another as well as among the different areas of the same country. There are several studies published that have attempted to establish the correlation between the indicator of dental caries in mixed dentition and the risk of maxillary dental anomalies, as well as the way in which intra-arch and inter-arch modifications occur. Premature loss of temporary teeth, as a consequence of untreated dental caries, can cause severe three-dimensional disorders of the dental arches and implicitly of dental occlusion, interfering with the harmonious development of the physiological dentition. Orofacial pain is manifested in the face or oral cavity area, and includes the disorders of TMJ . Between 5-12% of adult people in the United States , 33% of the adult Chinese population in Hong Kong , and 33.3% of 2005 individuals in Italy , experience pain associated with disorders of the TMJ. The usual symptoms of myogenic temporomandibular disorders (TMDs) are represented by the facial pain, earaches or ringing of the ears, dull, chronic headaches, jaw locking, clicking or popping sounds in the jaw joint, a bite that feels uncomfortable or “off”, neck, shoulder and back pain, and swelling on the side of the face [5-7]. The classical treatment used were injections, physical therapy, splints, anti-inflammatory medications (that could have side effects when used over long periods of time), to which have been added self-management strategies, laser therapies and interventions based on cognitive behavioral approaches [8-10]. At present, a conservative treatment approach prevails over surgery, given it is less aggressive and usually results in satisfactory clinical outcomes in mild-moderate temporomandibular disorder (TMDs). Nocturnal grinding is a detrimental motor activity, a self-destructive parafunction, characterized by „the consequences of a normal function used in abnormal condition”. Differential diagnosis in nocturnal or day-grinding patients is realized according to the frequency of phenomenon, the destruction degree, the social discomfort and the manifested symptomatology. The metal-ceramic fixed prosthetic restoration which reestablish the continuity of dental arches  are widely used in dentistry. should allow on optimal adherence of the ceramics mass. Dental materials interact with living tissues they come in contact with and generate local or systemic responses . The biocompatibility of dental alloys is important and is considered a controversial problem for practitioner physicians . Among the causes of metal-ceramic restorations failure are cited in literature: degradation by corrosion of alloys, mechanical wear and fatigue fracture [7-9]. Corrosion is described as the destruction or damage of the material under the action of aggressive environment (atmosphere and oral fluids) . Metal alloys based on Chromium and Cobalt are widely used in the dentistry field . The Co-Cr or Ni-Cr alloys have good corrosion comportment because of Chromium presence, which forms a stable chromium oxide layer on the alloy surface [12-18]. In addition, the allergenic potential of Cr-Co based dental alloys is very small compared with the allergenic potential of the dental alloys based on Ni-Cr  in patients with allergic ground. Congenital cardiac diseases are the most common and severe anomalies present at birth, with a significant impact on infant morbidity and mortality. In Romania, 1,500-1,600 babies with congenital cardiac diseases are born every year. Of these, 850-950 a year require surgical correction. Each of these babies’ hospital discharge sheet recommends preventing infective endocarditis. For this reason, treating these patients is a challenge not just for pediatricians, but also for pediatric dentists or dentists in general. Firstly, these children are predisposed to developing infective endocarditis as a consequence of bacteremia induced by dental procedures. Secondly, children whose health is severely affected can have a low tolerance to the stress induced by dental treatment. Thirdly, hematological, respiratory and neurological complications, as well as any chronic medication administered, must be taken into account when preparing a dental treatment plan for children with congenital cardiac conditions [1, 2]. Certain authors believed that the role of dental procedures in inducing infective endocarditis had been overestimated [3, 4]. The prevention of bacterial endocarditis in the case of children at risk involves both parents and pediatric dentists knowing the risks these children are exposed to, as well as the responsibilities they have. Periodontal disease, which begins as superficial inflammation of the gingiva without attachment or bone loss (gingivitis) and later progresses to attachment loss with subsequent bone destruction (periodontitis), is one of the leading infectious diseases known to mankind. Results from a national survey conducted in the United States in 2010 analyzing the distribution of the disease found that over 47% of the adult population was affected . Furthermore, 38.5% of the population had either moderate or severe forms of periodontitis, which are more difficult and cost-intensive to handle due to the advanced loss of the tooth’s supporting apparatus and subsequently resulting niches that make infection control challenging . Thus, it becomes vital for healthcare providers to diagnose the disease as early as possible and provide appropriate treatment. It has been extensively documented that periodontal infections can be successfully treated by non-surgical and surgical periodontal therapy associated with meticulous oral hygiene.